The Student Council represents the interests and voice of the student body in various school committees and student governance. It promotes a positive relationship between the student body and the administration, faculty and staff, and creates new opportunities for community outreach events such as blood drives and fundraisers, to name a few. Goldfarb School of Nursing at Barnes-Jewish College is part of the National Student Nurses’ Association (SNA). The SNA is a pre-professional organization that helps nursing school students enter the profession by providing educational resources, leadership opportunities and career guidance. Our student members volunteer their time for community projects such as World AIDS Day, delivering holiday care packages for Siteman Cancer Center patients and organizing informational events such as the Goldfarb Speaker Series and NCLEX Trivia Night. The Goldfarb Ambassador Program is the premier student leadership opportunity within the College. Ambassadors support our student body by representing each program of study. They promote programs/services, participate in campus events and activities, and serve as student representatives that connect with incoming students. 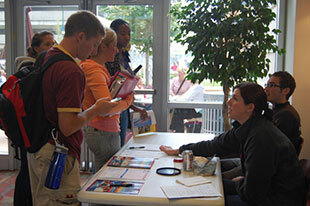 Ambassadors assist in many College functions including public relations, admissions/recruiting, and student engagement. VAST is a support group for students who are veterans, current military personnel, families of veterans, or those interested in a military career after nursing school. GMEN is a group that provides a forum for male students and alumni to discuss issues and offer resources to enhance their educational and professional development. This group promotes a deeper understanding of various communities, health concerns affecting them, and recruitment of more diverse people into nursing. SWAP is a support group for students who are parents.